It’s no longer secret that internet users are spending 50% of their time on social media. Every day millions of people especiallu webbers sample their content on Facebook, Instagram and twitter just to keep up with what's trending. What if I told you that you can convert the time you spend on Facebook, Instagram and twitter making money on social media? What if you are told that you can make enough money on social media by simply creating a 2min video…? This is when Skits comes into play. 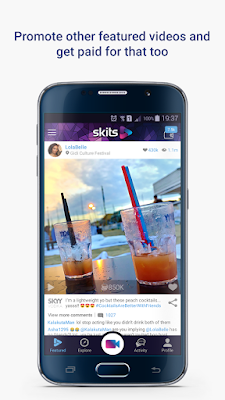 Skits is a mobile app that lets you monetize your social activity by getting paid to create fun videos for brands or to promote branded videos posted on Skits by other users. • Share any featured video from Skits to another social network like Twitter, Facebook andWhatsApp, or even send it to your friends by email or SMS. •If your friends watch the video you shared, you’ll get paid for each view. On average, you will get paid about 2 coins for each view you generate, but potentially more, depending on the video budget and the total overall number of views. You can cashout once your Coins bar is full. If you are the creative type, like mu man DaKreative. He's one of the dopest comedy video guys i've seen with his crew, they give an outstanding laugh time. If can create cool videos like him, you can enhance your earnings by creating your own video. 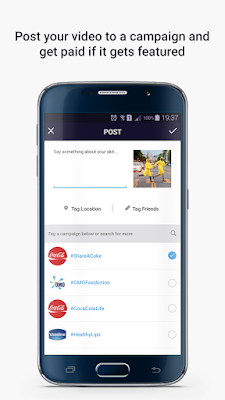 • Record something fun and relevant to a campaign. •If the brand features your video, you’ll earn 10 coins each time your featured video is promoted by other users. In other words, it’s time to start making money doing what you know how to do best other than liking your friends facebook update, tweets and instagram pictures; start making money with skits app. For Android users, you can download it from Google playstore, While iOS users can use the mobile web app until the iOS app is Available.